TORONTO — The heavy Grey Cup favourites after winning 15 games this season, the Calgary Stampeders remained the talk of the town on Thursday night, cleaning up at the Shaw CFL Awards with five different major award winners. 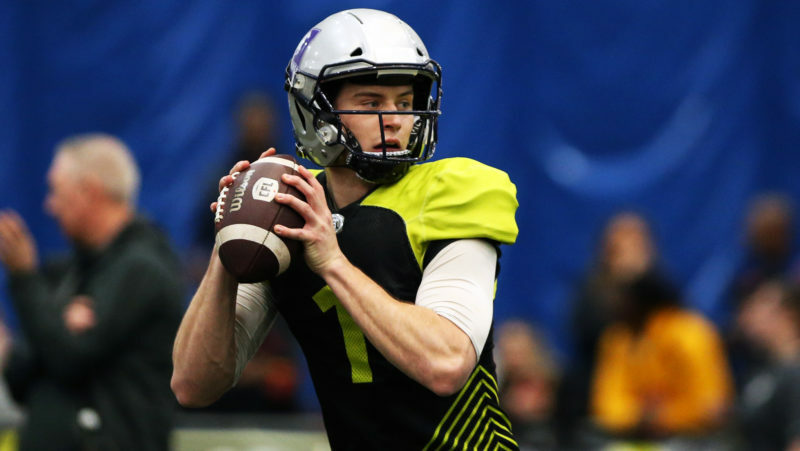 Bo Levi Mitchell took home Most Outstanding Player honours as the 26-year-old Katy, Texas native continues to build on a budding legacy that already includes a Grey Cup Championship and a Grey Cup Most Valuable Player award. “It’s cool to get recognized for all of the hard work that you’ve put in not just this year but over your life and your career to get yourself to this point,”said Mitchell. 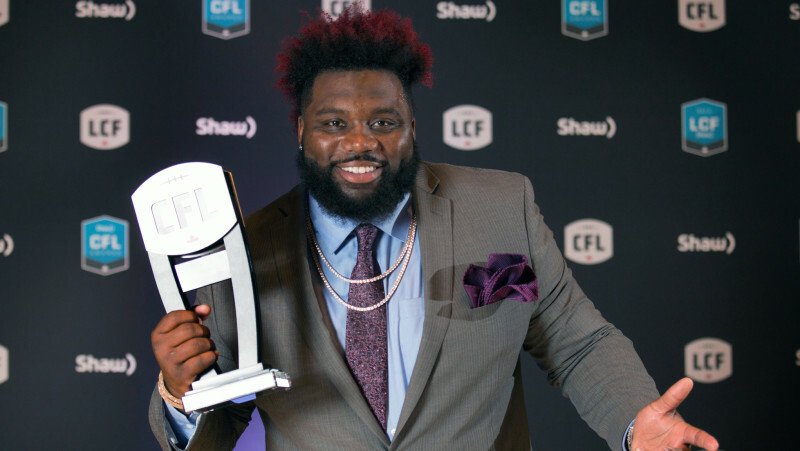 Jerome Messam (Most Outstanding Canadian), DaVaris Daniels (Most Outstanding Rookie), Derek Dennis (Most Outstanding Offensive Lineman) and Head Coach Dave Dickenson (AGF CFL Coach of the Year) were the four other Stampeders taking home honours. “We put in the work,” Mitchell said of why so many of his teammates won awards. “We read the newspaper clippings in the beginning of the year and in preseason and took to heart what people said about us and what we were going to be. We all took it to heart individually but more as a team. The annual event took place at the Art Gallery of Ontario in Toronto as part of the festivities for the 104th Grey Cup Championship presented by Shaw. The week culminates with a Grey Cup matchup between the Calgary Stampeders and Ottawa REDBLACKS on Sunday at BMO Field. Other winners include Justin Medlock (Most Outstanding Special Teams Player), who set a scoring record in his first season with the Winnipeg Blue Bombers, and Solomon Elimimian (Most Outstanding Defensive Player), whose Cinderella story had him returning to dominance following a devastating season-ending Achilles injury in 2015. 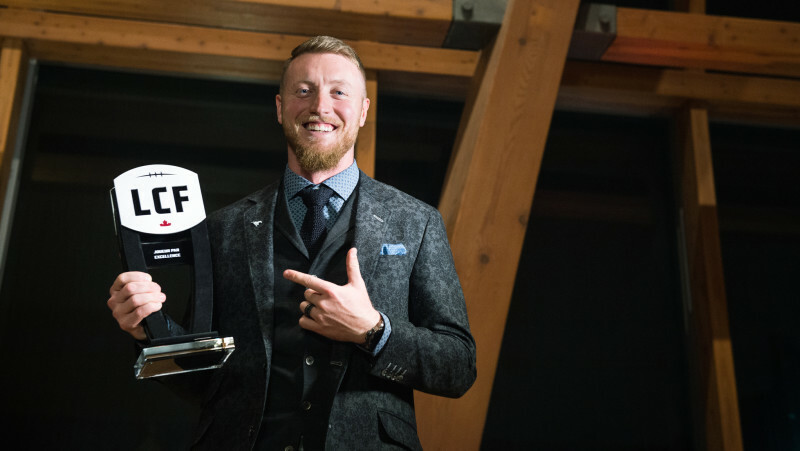 Bo Levi Mitchell was named the Most Outstanding Player, capping off a stellar 2016 for the young quarterback. The 26-year-old helped lead the Calgary Stampeders to a Grey Cup berth and to a 15-2-1 record in the regular season. He finished the year with 5385 passing yards – good for second in the league – and 32 passing touchdowns, the most in the CFL through 20 weeks. In his fifth year in the Canadian Football League, the Katy, TX native had his most effective campaign this season. He finished with more completions (412-of-606), more yards and more touchdowns (32) than he had in any of his previous four seasons. Despite not playing in a game for a month, Mitchell dominated in the Stamps’ Western Final victory over the BC Lions – throwing 365 yards and three touchdowns, including one on the opening drive – solidifying Calgary’s trip to Toronto for the Grey Cup. Ottawa’s Ernest Jackson was runner-up. Solomon Elimimian’s comeback trail continues to be one of triumph. The veteran linebacker capped off a Cinderella season with his second Most Outstanding Defensive Player honour, capping off a long road back from the Achilles injury that once put his career in jeopardy. 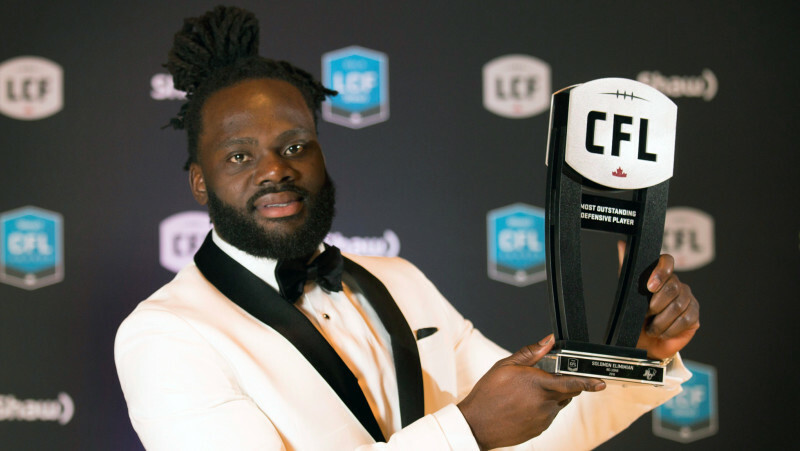 Elimimian also won the honour along with Most Outstanding Player in 2014. “It means a lot,” said Elimimian. “As you guys know, I tore my Achilles last year. Something my dad always told me there’s three thing always guaranteed in life: death, taxes and adversity. The 30-year-old finished 2016 on top of the CFL in defensive tackles, racking up 129 – his second most effective season in the league. As one half of ‘Team 100’ – the other half being teammate Adam Bighill, who won MODP in 2015 – Elimimian was a nightmare for any offence that he faced throughout the entire season. The 6-foot, 225-pound linebacker also notched one special teams tackle, one interception and eight sacks in his seventh season in the league. Elimimian beat out Bear Woods of the Montreal Alouettes for the honour. Woods was second in the league in tackles, just three behind Elimimian. Jerome Messam was almost unstoppable this season, plowing through opposing defences on the way to a Most Outstanding Canadian honour. Messam led the league in rushing yards with 1,198 and was only one of two players to rush for over 1,000 yards. He also scored the second most touchdowns in the league this season with 12, just one behind BC’s Emmanuel Arceneaux. 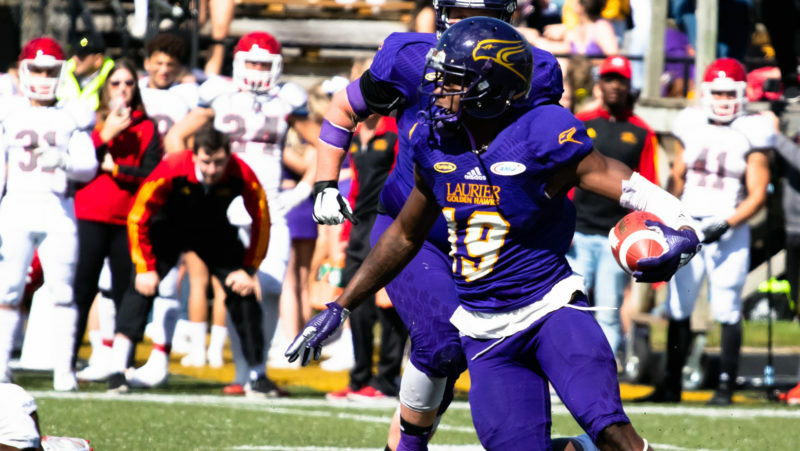 The Toronto native had his most successful season in the league in 2016, doubling his previous best touchdown total of six in 2011 when he was a member of the Edmonton Eskimos. The 33-year-old was versatile this season as he led the Stamps’ ground game but also acted as a pass-catcher, hauling in 485 yards receiving along with a major score – the most receiving yards in one year in his seven year career. 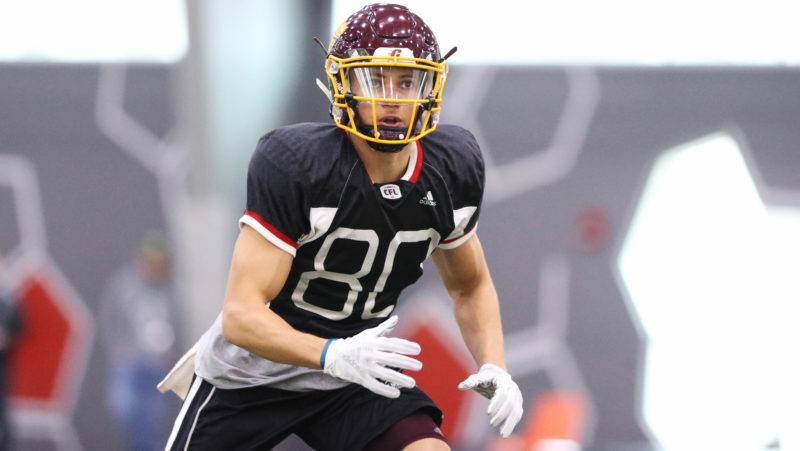 Ticats’ Chatham-born Andy Fantuz, who was the first Canadian receiver to reach 100 catches since 2008, was the runner-up. Dave Dickenson looked like a seasoned vet in 2016 – despite it being just his first season as a head coach. 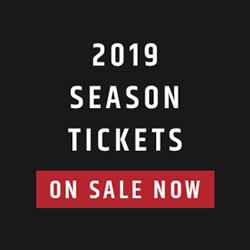 Dickenson was named the AGF Coach of the Year after leading the Calgary Stampeders to a 15-2-1 record in the regular season after stomping his way through the Canadian Football League. Those 15 wins as a rookie were also a new league record. He also led the Stamps to a 16-game unbeaten streak, which was a single-season league record. The former quarterback also led his club to a 9-0 record at home at McMahon Stadium. Now, Dickenson will make his first appearance in a Grey Cup as a head coach as he hopes to cap the Stampeders’ record-breaking season with a win at BMO Field. The 43-year-old edged last season’s AGF Coach of the Year, Rick Campbell, for the honour. 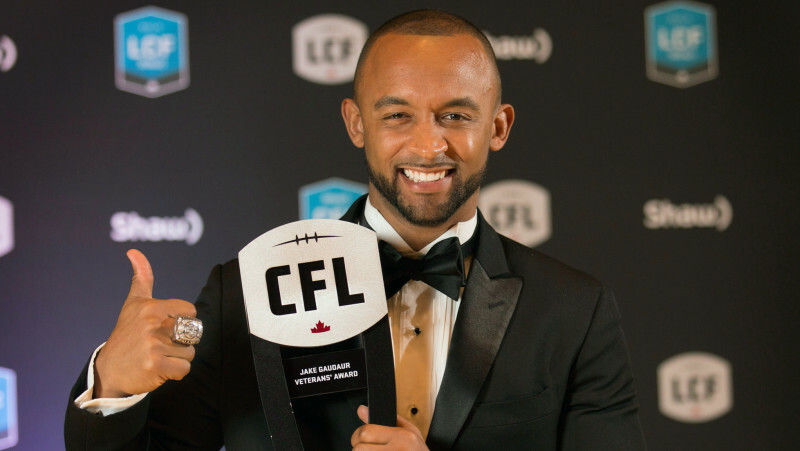 After having one of the best seasons of his CFL career, Justin Medlock was named the Most Outstanding Special Teams player. Medlock, who signed with the Winnipeg Blue Bombers as a free agent before the beginning of the 2016 season, finished the season completing 60 of his 68 field goal attempts. That broke Dave Ridgeway’s record for field goals in a single season, whose 59 field goals in a season record was set in 1990. The 33-year-old is also the CFL’s all-time field goal percentage leader (87.7 per cent). Medlock booted a 58-yard field goal this year, tied with Hamilton’s Brett Maher for the longest kick this year, and made all 33 of his convert attempts. Hamilton’s star special teamer Brandon Banks is the runner-up to Medlock after having another successful season as the Ticats’ return man. Derek Dennis gets the honour after helping to lead Calgary’s offensive line to feature the league’s leading rusher, Jerome Messam. He also helped to anchor the wall to defend the pass rush by only allowing Bo Levi Mitchell to be sacked 20 times – the least amount in the league – and allowed for the most offensive touchdowns to be scored. The 6-foot-3, Queens, NY native helped to allow Mitchell swoop to the top of the league in passing yards (5,385) and passing touchdowns (32). Dennis will compete in his first Grey Cup as he hopes to bring the championship back to Calgary. In his second year in the CFL, the 28-year-old beat out Ottawa’s Jon Gott for the award. He didn’t play his first game until August but Calgary Stampeders receiver DaVaris Daniels never once looked out of place. 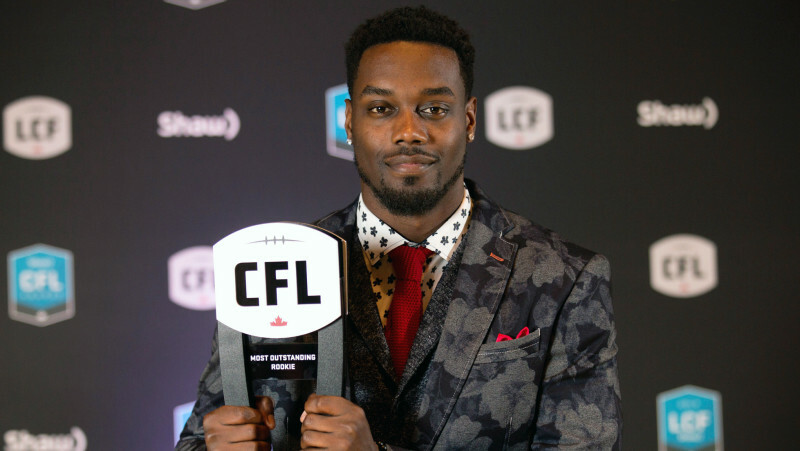 Now, the 23-year-old is the CFL’s Most Outstanding Rookie after earning the honour on Thursday night at the 2016 Shaw CFL Awards in Toronto. Ottawa REDBLACKS offensive lineman Jason Lauzon-Seguin is the runner-up. Week in and week out, Daniels made spectacular catches and provided quarterback Bo Levi Mitchell with a constant steady hand in the Stampeders’ receiving corps. In just 11 games with the league-leading Stamps this year, the Notre Dame alumnus hauled in 51 receptions for 885 yards and nine touchdowns. The 6-foot-1, 207 pound wideout had four games with over 100 receiving yards and three two-touchdown performances. Daniels had become a go-to target for Mitchell throughout the campaign and the playoffs weren’t any different. In the Western Final against the BC Lions, Mitchell scrambled out of the pocket and aired out a 76-yard touchdown to Daniels, adding to the Stampeders’ lead in the first half. Daniels’ one-handed catch in the end zone against the REDBLACKS in September, meanwhile, is a play of the year candidate and one that no one will soon forget. The Honourable Kent Hehr, Minister of Veterans Affairs and Associate Minister of National Defence, and the Canadian Football League (CFL) Commissioner, Jeffrey L. Orridge, presented the Jake Gaudaur Veterans’ Award to Matt Black, defensive back for the Toronto Argonauts. The prestigious and coveted award is a highlight of the Shaw CFL Awards every year. This year’s recipient, Matt Black, has exemplified strength, courage, perseverance and comradeship throughout his entire life. As a child, Matt was diagnosed with dyslexia, a learning disability that had a profound impact on his childhood. Matt’s experience breaking through misconceptions from a very young age has motivated him to use his platform to open up and inform youth about his struggles with dyslexia and his feelings of being helpless and hopeless at times. “A lot of my coaches (at school) were volunteers and they kept me out of trouble,” said Black. “I had a lot of friends that went to the other side and (they were) some people that got into trouble and that could very easily have been me had I not had a strong foundation at home and been involved in extracurricular activities that I was. As a professional athlete, Black has shown that he is a true leader, both on the field and in the community. His ability to bring people together is part of what separates him from others. Matt Black is currently the longest serving member of the Argonauts’ renowned Huddle Up Program and he has taken it upon himself to be involved in the team’s other numerous community programs. The Minister of Veterans Affairs and the Canadian Football League are proud to recognize Matt Black as this year’s recipient of the Jake Gaudaur Veterans’ Award. Marco Iannuzzi is the recipient of this year’s Tom Pate Memorial Award, given to a player who displays qualities that distinguish him from his peers. The award is handed out annually for outstanding contributions to the community as well as the team and fellow players through the Canadian Football League Players’ Association. The Lions’ pass-catcher volunteers his time to more than 50 charitable events each year. He’s been a speaker, and ambassador and an auctioneer among various other roles for Autism Canada, the Multiple Sclerosis Society of Canada and the Canadian Diabetes. The CFLPA salutes him as a shining example of the work CFL players do all year long in every CFL city. The life and legacy of Canadian football legend, four-time Grey Cup champion and Alberta icon Norman Kwong was honoured this evening with the Hugh Campbell Distinguished Leadership Award at the Shaw CFL Awards. “He was a trailblazer. It could not have been easy, back in the 1950s, to be the first Chinese-Canadian to play in the league,” said Ottawa REDBLACKS head coach Rick Campbell as he presented the award that bears his father’s name to the Kwong family. The Hugh Campbell Distinguished Leadership Award is named after the legendary player, coach and executive who amassed ten Grey Cup victories, including five consecutive titles from 1978 to 1982 as coach of the Edmonton Eskimos. 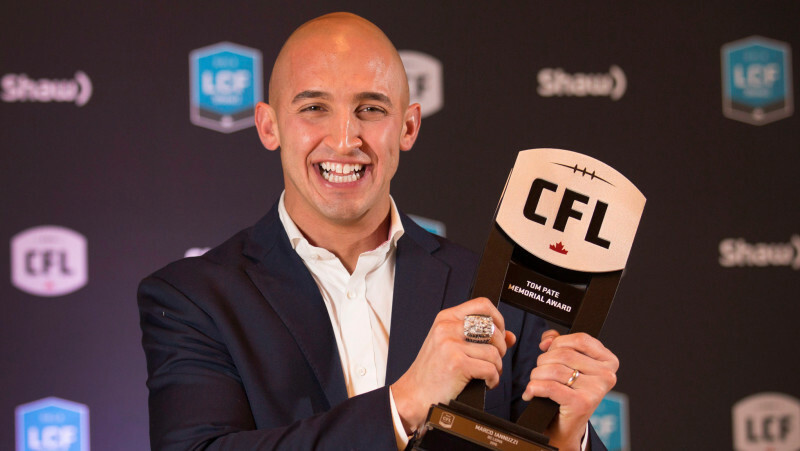 It is awarded to an individual, chosen by the Commissioner of the CFL, who has demonstrated great leadership and has made significant contributions to the league. Kwong was indeed a trailblazer as an athlete and businessman. He became the first Canadian of Asian heritage to play for the CFL when he joined the Calgary Stampeders in 1948; he holds the distinction of being the youngest player to win the Grey Cup at the age of 18 with the Stampeders. He was a dominant running back throughout a career that lasted more than a decade in Calgary and Edmonton. His tenacity and determination earned him the respect of his competitors, while garnering numerous accolades. Entering Edmonton’s season finale in 1955, Kwong trailed the league rushing record by 149 yards; he eclipsed the mark by totaling 192 yards, while establishing new records for rushing attempts in a game, carries in a season and rushing yards in a season with 1,250. He concluded the campaign by adding records of 30 carries and 145 rushing yards in a championship game en route to a Grey Cup victory. His record-setting season earned him the Lionel Conacher Award as Canada’s male athlete of the year. 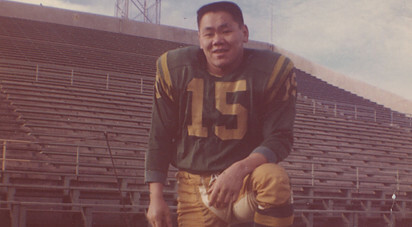 Kwong held over 30 CFL records upon his retirement from football in 1960. The five-time all-Canadian was twice named the CFL’s Most Outstanding Canadian and was inducted into the Canadian Football Hall of Fame in 1969. After the conclusion of his career, Kwong led a successful life as a business leader before becoming the first Chinese-Canadian to serve as Lieutenant Governor of Alberta from 2005 to 2010. Ever an ambassador for sport who championed his home province, Kwong was a member of the ownership group that brought the Flames to Calgary and a successful president and general manager of the Stampeders. He was a generous member of the community, counting time spent as honourary chairman of Calgary’s Easter Seals Campaign and national chairman of the Canadian Consultative Council on Multiculturalism amongst his many roles with non-profit organizations. He was appointed to the Order of Canada in 1988. He died on Sept. 3, 2016 at the age of 86, survived by his wife Mary, four sons, and 10 grandchildren. An “unsung hero” was recognized tonight for more than three decades of dedicated service to the Toronto Argonauts, the community and causes that serve youth. 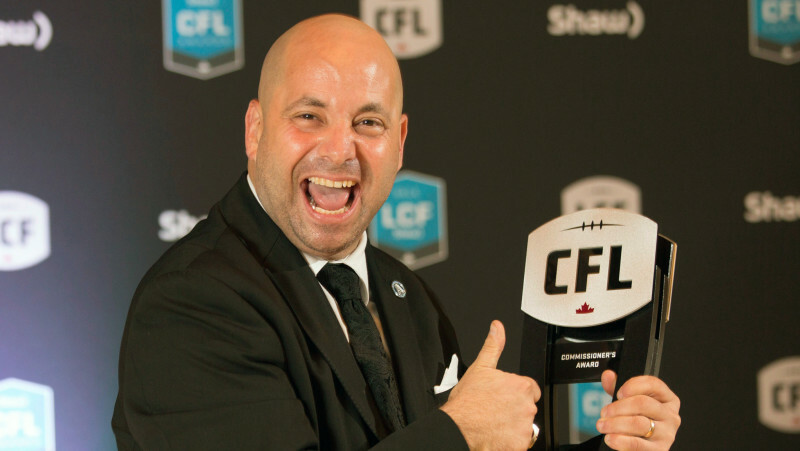 Jason Colero, the Argos’ Director of Education and Community Programs, was honoured with the Commissioner’s Award, presented each year to an individual or group that has made an outstanding contribution to the development of football in Canada. Colero developed the Level the Playing Field Program which has helped grow and support high school football programs across Toronto. “Our league has always understood that the causes we champion are just as important as the champions we crown,” said Jeffrey L. Orridge, Commissioner of the Canadian Football League. Colero has been with the Argonauts organization for 32 years, starting as a mascot, ball boy and locker attendant before transitioning into the club’s community programming in 1999. During his tenure, he has contributed to initiatives aimed at preventing violence, promoting physical fitness and healthy lifestyles, recognizing community coaches, ending violence against women and many more. One of his proudest achievements has been the Argonauts’ Huddle Up Bullying Prevention Program, presented by Tim Hortons. Currently in its 16th year, the program has visited more than 600,000 students across several school boards in the Greater Toronto Area. The program works closely with the Canadian Safe School Network to make a stand against bullying in schools and the community. “There are kids in this city who were despairing, who thought they had nowhere to turn and no reason to go on, until Jason and the Argonauts visited their school,” Orridge said.